Welcome to the Purpose Nation Podcast, inspiring conversations with Christians in science, technology and industries of the future. For more information or to make a tax-deductible contribution, visit PurposeNation.org. This is Brad Cooper with Purpose Nation and today we are going international with the podcast and we're speaking to Fr. Eric Salobir, who's joining us from Southern France right now. Father Salobir, welcome to the Purpose Nation Podcast. Hello and thank you for joining. You travel pretty much around the world from what I can tell speaking in in many different audiences. Where will you be traveling over the next few weeks or months? What are your travel plans look like right now? Oh, actually, currently we're building new branches, opening new branches of OPTIC. I will talk about that later in Europe and so I go from Brussels to Geneva to Vienna to Berlin. That's more or less my playground now. But I will have to come back to the [Silicon] Valley very soon because I have a lot of friends there and also because many things happened around so I will be close to you very soon. Okay, good. Yeah, I hope so. Hopefully we'll see you in California again soon, either, in southern, in Silicon Valley, in Northern California or down in where we are in Southern California. We'd love to love to see you out here. And, and maybe we'll see some day in Europe. So Fr. Salobir has a fascinating background. He's a Roman Catholic priest and a member of the Dominican Order and actually in charge of the media and technology for the Dominicans and he's also the founder of OPTIC Technology and it's a sort of a Catholic network which promotes research and innovation and various technology fields and actually, OPTIC is very similar to Purpose Nation and in some of what we do and then it's basing its work on a Christian viewpoint, looking at these disruptive technologies and the ways that they could help humanity. Maybe some of the ethical concerns with them, but just a great organization. And, and we'll talk about OPTIC more in a moment. 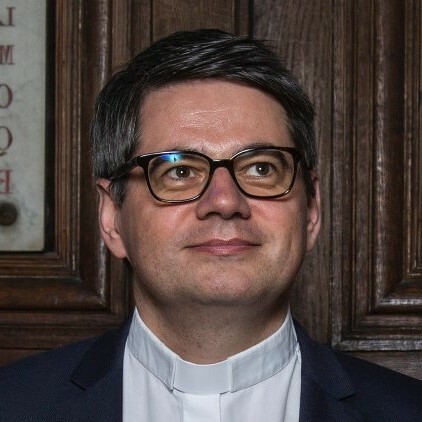 He's also a consultant for the Pontifical Council of Communication as well as an expert for the delegation of the Holy See at UNESCO. He teaches digital communication at Catholic University of Paris. He's a graduate of ISC Paris Business School and worked at the French Embassy in Prague and also worked in banking for a while. So I'd love to hear more about, you know, how you went from banking to where you're at now. And he joined the Order of Dominican in 2000 and graduated in theology and philosophy. He travels the world, as I said, and speaking on many important technology conferences and panels on topics like Internet Security and Artificial Intelligence and Trans-humanism and all these buzzwords that folks may have heard bantered about and in some of these impacts of, of disruptive technologies. So Fr. Salobir has been on many of these different panels and speaking at conferences on these issues and I'm just so blessed and glad that he is on all of these things and is having an impact. And so, father, you're just, you're a busy guy. I try to be busy. Yes. I mean that's I, I decided to dedicate all my time to let's say help the people, so help the people in preaching, help the people in teaching, but help the people also in understanding our world, their world, the world they're working or they live in and trying to have a better view of the challenges and opportunities of technologies. At first I was more involved in the media, then digital media. Then I switched slightly to technology and I was asked by the Church, but also by stakeholders from the tech side to convene people around the table coming from various backgrounds and perspectives to have original, let's say different conversations on technologies, especially AI, Blockchain and so on. So I would say that I consider myself as on a duty for that so I',m on a mission. So that's why I try to spend all my time and all my energy focused on that. Amen. That's great and great to hear. One of the big things that you're involved with and you're the founder and president of OPTIC Technology. Tell us a little bit more about that organization. How did it get started and what are the main goals? What do you, what do you do with OPTIC? I would say that OPTIC is a network of explorers. We try to explore the blind spots of the conversation around certain technologies because there are many things which are said in the media. There are so many conferences, so many events around those topics, but most of the time we see that some of the aspects, some points are never explored and when we, or they, implement technologies and when I say a they, it can be the stakeholders, technology developers, but also the regulators, governments and so on or NGOs. Things can happen that can be positive or negative depending on the vision. Do we have a clear vision of the situation and also of the psychological, anthropological and philosophical impact of those technologies and it's not only theoretical. I would say it's very pragmatic and we see that too often we don't have this clear vision, so what we try to do OPTIC is a network of people coming from the human sciences but also coming from the tech side, the business private sector, people from the regulators, from NGOs, from the civic society and all of those people sit around the table and talk about a specific topic and write a white paper or prepare conference or whatever. So that's what we are. We're at the same time or research network and we are also a network of people trying to have what we call high level dialogue but can involve the United Nations, that can involve some of governments and for sure most of the time plenty of people coming from the big companies or the tech side to try to have these big picture of what happens when we implement disruptive technologies. And now it was started, I believe through the Dominican Order and then I think it branched out. You branched out more independently on its own, but I assume there's a very deep Catholic Christian stance and kind of foundation within your organization. And is that sort of, well, is it, I guess and then how does that frame your Christian, your Catholic Christian background, how does that frame the way that you look at these different technologies and how you work to look to work with I guess more secular organizations? I would say that dealing with science and technologies is in the DNA of the Dominicans since the 13th centuries, since the very beginning and for example, Thomas Aquinas dealing with Aristotle and interacting with let's say pagan philosophers was already on the edge on one side. He was such a deeply Catholic theologian. On the other side, he was exploring. He was really on the border. They say these movement between the center of our tradition and going to the border, going to the people who are different was already in what he was doing and Albert the Great did exactly the same with science and during all the history of the Order, we had many friars working with scientists or people involved in technology. In the 50s, for example, we had one of the brothers involved in the MIT or dealing with the people who have funded the MIT about what they called cybernetics at that time, which was more or less the ancestor of AI, and let's say that what I do is nothing different than continuing this tradition trying to go forward with this tradition and for sure what we do is deeply rooted in a Christian anthropology that's clear. So let's say that our network is non-denominational because we want to welcome everybody, everybody who has let's say the same vision consistent in putting the human being the center of the development of disruptive technologies, but for sure our definition of what's the human being. If we deal with transhumanism and whatever is a Christian anthropology. So let's say the background is very clear. The basis is also very clear with but the way we engage with people, let's say we don't advocate for something, we try to enter into a dialogue in a way which is more or less what the Church does since a long time with science because between science and faith is the kind of longterm relationship. Time to time it was a difficult... it's like in a couple... of times to time it is a difficult relationship. Time to time, it's an easy relationship. But, we go forward together. Science and technology on one side and faith and theology on the other side. And now you've also been pretty connected with technology and you mentioned Silicon Valley, in fact you've put together and hosted a few Hackathons which is very interesting and has gotten a, thankfully has gotten some attention in the media and so I think you might've had one in Silicon Valley and then most recently here at the Vatican. Tell us more about the Vatican Hackathon. How did that come about and what was that all about? Yeah, our point is to try to take part of the tools coming from technology to solve problems that we discover in the Church. That can be problem of the Church. Parishes, relationships in the congregation. Everything you about preaching or teaching. But it can be also problems of the society that the Church discovers because the church is a kind of expert in humanity and the church does a lot for the human being in teaching, education, but also providing health care and so on. The Catholic church is the first healthcare provider in the world. And so, what we do in in San Francisco two times, then in Paris, we have identified a couple of challenges and propose those challenges to young, very talented and creative people and they had to try to find technical solutions to ease the communication of a parish or to help people to pray on the go when they commute or whatever... many things like that. And more or less, one year ago we had a visit of students from Harvard, from the Harvard MBA, and they came to us and say, "Oh, you should organize a Hackathon." And for them I think it was kind of challenge, like the Church will never organized a Hackathon. And we said, oh yeah, that's a good idea. That will not be our first one. And I think there were a bit surprised at the answer and we said, "Okay, that's a good idea to do that in even symbolically in the Vatican, but let's do that together." So it's not like the church will organize its own Hackathon. All these teams of students will organize with us a big event, the same deeply rooted in the Vatican, but also very open to everybody. And so it took one year to put all of that together. And after one year we gathered 130 students, 30 to 40 mentors, observers, journalists and so on. So altogether almost 200 people. And we hosted in Rome a Hackathon on three key topics which were provided by the Vatican and the Holy Father. It was: Fostering inter-religious dialogue, helping the poor and underprivileged people and supporting refugees and migrants. The three big topics and for each of those topics we had something like 15 very precise challenges. And each team had to pick one of them and to shape an answer, to propose a project which had to be really disruptive but also very pragmatic and feasible. And we had selected one winner for each of those categories and it was a great experience because first of all we had students from 62 universities, 30 countries for sure, all the big universities like Stanford, MIT and so on, sent immediately teams and that's fine because they are very good universities, but we are, we are also, we wanted this Hackathon to be really inclusive, socially speaking and we wanted everybody to be able to apply and so we paid for part of the ticket because we didn't want people to be blocked just by finance by not having the money. And so a big part of the budget was for hosting, feeding and flying those people. And so we had people from many religions. That was really interesting because on one side it was so much in the Vatican, on the other side, we had Sikhs, we had Buddhists, we had Tamul, we had Muslims, Jews, Catholics any kind of Christian churches or denominations. And it was really interesting. And so they worked together. The mentors from our sponsors, big private companies in the tech. So, uh, most of them coming from your coast, from the West Coast, let's say financed and sent sponsors, and I would say for example, that Salesforce send 10 mentors, including one of the vice presidents. So it was a very, very good and at the same for Microsoft, the same for Google. They sent very experienced people to help the students to take the best of the technologies for this purpose. And it was so, it was a good experience with because of the meetings or those students and all those tech people, but also because many very senior people from the Vatican came to have a look on that. For example, the Prefect of the Pontifical Council for Culture came. He tried the Oculus Rift, so trying to play with virtual reality. He met the teams, talk to the people and he was very happy with this meeting. He was really enthusiastic. The same for the President of the Pontifical Academy of Science who came, gave I gave a little speech to the students, but it was really deeply rooted. It was really dense and the participants were very happy with that. And I think he was also an energized by the meeting with those young people, young, good willing people. Let's say that a big part happened during the event and that's great because I told you that they came from around the world and any kind of religious background. Some of them believing absolutely, nonbelievers, believe nothing but it finished on Saturday evening and on Sunday morning, pretty early, we had a mass in St. Peter. We expected to have no more than 100 people because the Catholics were not the majority, but all of them came. It was amazing. It was in the crypt. Most of them standing because we did not have seats for everybody and it was packed of people and we said for the ones who are not believers the believers can come and receive the holy communion if you baptized and if you can do it, but for the other ones you just can come and ask for a blessing. Just cross your arms on your chest and you just receive a blessing. And so many of them did that. It was absolutely beautiful to give the blessing to so many people from very different religious backgrounds, but understanding what we were doing, why we were doing that and being more or less in communion having discovered something from the Catholic Church. That's great! That's great. That's an amazing event and it just sounded like it went so well and like I said earlier, it got covered in the media and you get covered in a lot from Wired and all these different places. Showing a couple of things. One that the Vatican obviously is very... and Pope Francis in particular... sounds like he's very interested in the Church keeping up with these technologies, but then like you said, also bringing these technology people in, young people especially, which is great into the Vatican and in into an event organized by the Catholic Church and other groups to bring them all together and that sounds like a great event. Ha Ha No... Not this time. Next one I hope so. OK, next one we'll get him out there coding something. Yeah. The Pope was informed about the event and they had the end. He gave his blessing to the event and probably that's the first time in history of that a Pope says the word "hackathon" publicly, so it was pretty interesting too. That's a good first step. What I would like for next year is to have him really in the event working a bit more with the students. That would be great! And then what was the winning team or what was sort of the one of the more interesting presentations that the student teams made? Oh, one I like a lot. So we had several winners, but one I liked very much is a platform to help homeless people to find little jobs. Absolutely, without, absolutely any skills and pretty short term, but a way to give them revenues, first, and to create new links around them to show them that they can be useful for the community and those jobs are crowd funding. So for example, if in your community there's a park which is absolutely ugly and it needs to, it needs to be cleaned and and so on. All the community members can give a little bit of money and so then we'll do the job. They will be decently paid, they will be recognized and they will be known in the neighborhood and so that's a platform with a kind of booth which is in each shelter or home where volunteers can add them to register and to select to pick an offer, go do the job, get the money and so on. So a good way to put them again in the loop and that's great. It was absolutely well done. Easy to use, a way to help them also to shine a little bit too to show that they can do things on their own by themselves and a way for the communities to give them help, which also is useful for the community. So it's kind of win-win game. Yeah, that sounds like a great one. And again, these are just great topics to get young people thinking about and coming up with ideas and hopefully some of these ideas they'll continue with and that happens a lot in some of these Hackathons. They code some software or they come up with some ideas and then they continue it and it ends up being a product or something or something that helps people. And so, uh, so great. That's all fantastic and hopefully that continues and God continues to bless that event and people who are participating in it. Taking a step way back here a little bit Father, I'd love to learn more a little bit about you. Tell me a little bit more about your background. So how do you go from, it sounded like some business and a banking background to organizing hackathons at the Vatican? Ha Ha... It must be an interesting story in there somewhere? For sure. I was in business but I have never left the business, but just now I do business for Jesus and that makes the difference for me. What I mean is just that everything I've discovered in the life out of the church in terms of a business organization and so on, I try to reuse or try to leverage on that in my mission. And so what made the change for me, because I was in a bank, mergers and acquisitions, it was a very challenging, got beautiful revenues. I had a nice life actually, but there was no real purpose or the action and the purpose was not were not exactly aligned. And so I've seen that what was the most important for me was what I was doing at that time. I was a scout leader on the weekend, I had some prayer groups at night, but working all day long, even having a nice job just to be able to let's say, to eat and then to do my favorite things at night and on the weekend was more or less meaningless. And so at some point I've seen that there was something wrong in my life. And so I had a long time of prayer and meditation and actually I was a bit confused because I didn't want to ask myself THE question. And the question was, would you like to be a priest? Do you think there's a call to be a priest? And when I said, okay, I have to consider this question, the answer was obviously yes. One day I went to enter in church, I don't know why, just had a period of time in front of the statue of the Virgin Mary and said, "Okay, lead me to your son." I don't know how, I don't know where, I don't know how it would be, but just "help to discover your son." And I would say that's what she did because the Dominicans is a religious order, which is under the blessing and the protection of the Virgin Mary. And my feeling is that, that she probably she succeeded because she led me to Jesus and then I became a priest, but she never left me alone because now I continue to be under her protection. So I have this feeling there's a very special relationship with the Virgin Mary and this feeling that even if I do something which can sound very secular, this link will always be very strong. And so how did you just join the priesthood? I mean, there must have been some steps there involved and he had to leave your banking job and it must've been a pretty big change for you? I resigned in one day, jumped into the novitiate, which is bit like it's pretty cold water, let's say, because it's very disruptive. I mean when you have responsibilities, you have a nice life and so on and from one day to another overnight you have nothing. You have no social status, you have no money, you have no responsibilities, you have nothing to do except pray and study. And wow... everything that protects you, everything that that makes you, supports you in the society disappears and you just have to discover what supports you inside that really makes the difference. It was not bad, I mean, but it was strange, took a lot of my energy... I disappeared during one year and when I came back let's say I had studies, starting to study theology and philosophy, then I was a bit different I would say. But it like deep diving and then coming back on the other side a bit different and ready to study theology. That's an amazing story and you also I think got involved with media and then as you said, and then kind of more in technologies and maybe some Internet things. I mean, did you have an interest in technology and media and digital media and things like that prior to the priesthood? Uh, in technology for sure. I was a nerd from the very beginning, so it's not a surprise, but for the rest it's only the providence. I mean having no, no plan. And when I was the Novitiate, I have met a journalist and she told me, "Oh, you should come on the radio." She was managing a Christian radio station and say, "Oh, you have to come and you can be an intern or you can have a little. You could have a little job in my radio station." And I say, "Why not? That sounds funny, let's do it." And the year after she resigned because she wanted to marry and she wanted to move in another place. She says, "Okay, from journalist, you will become the chief editor." And I say, "Oh my God, how can I do that?" She says, "Oh, you're Dominican. So God will provide." Ok. Ok, why not. So just found that really confident, a bit nuts, a bit crazy to be honest. But I said, "Okay, why not?" And then I became the chief editor of this radio station. Two years later I was still a student. We started an online lent retreat, which is called in French, "Retraite dans la Ville," which means, "Retreat in the City." You don't need to leave your family and work live during land. You don't need to resign to quit to go away. You can pray and you can have a fruitful lent. Even having all your normal life with kids, wife and so on. So that was the proposal. It was in the year 2000 and something. So at that time it was not so usual to pray using devices and computers. But we did it. And now currently it's very famous in the French speaking world. Now it's still existing very big. I stayed in this field so I manage, for example, the TV program or a French TV. We have a Catholic show and we have online programs and so on. So I was in charge of the Web TV around the Catholic show. So I did that for a couple of years. And each time someone proposes me something. So just say yes, actually. Let's do like the Virgin Mary. Never say no, just say yes. It sounds like you've been saying yes to a lot of different things. You're involved a lot and started a lot of different things there in France and beyond, so take taking it now back into the present and now looking into the future, it seems like I said earlier that the Vatican and Pope Francis has taken an interest in some of these different trends and technologies and how it impacts youth and how it impacts the Church. These technologies, as as you've discovered, are moving pretty fast. The Church is not known for moving fast. Do you think that's changing? I would say the Church is famous to move prudently and I think it doesn't have to change. What I mean is just that we have to take time to think because we're in the, let's say, the time when people want to go so fast to implement technology, so fast to go ahead, to have market shares and so on, to be the first ones to do something, to be disruptive and ground breaking and so on and most of the time we can miss the center. We can miss the point because we don't spend enough time thinking and what we try to do at OPTIC is okay, don't slow down, but put some resources in parallel to think about the things too. To have a real deep reflection on what we're doing so that in that way we will try with all the Catholic Church to speed up to be sure that we think at the same time as things are implemented on the other side for the same for the implementation, for all the pastoral views and so on. We have to be on the edge. We have to be on the forefront, but on the other side. But let's say for the theological perspective and philosophical perspective, we need to take our time. We need to be sure that what we do, we don't try to be fashionable, we don't try to be trendy. We want to be sure that we go step by step and there is no mistake in what we're doing and for that for sure it will take a bit of time. But for me it's not a problem. Oh that makes sense. And yeah, and we hope that some people are out there thinking about the impacts of some of these technologies because of them are pretty disruptive. What are some of the things that maybe excite you the most that have the most promise and what are the some of the things that concern you or maybe keep you up at night, if anything? Most of the time both are the same. And then for me, the currently the most exciting and at the same time powerful and potentially dangerous technology is AI and currently it's even the interaction between AI and bioethics because new things are happening there which are so brand new that we don't have the, let's say, the moral framework. We don't have the ethical background to think about that, but that can be absolutely hyper powerful. I think for example, it will be probably possible using a mix of AI and biotech to cure a lot of disease and even for example, to aid disable people to recover in a way which was absolutely even impossible to imagine, let's say 10 years ago. I'm sure that we can do so much with that and even if just we think about AI, pure, pure AI machine learning as it is used currently, so I don't about the kind of any kind of Terminator or big brother whatever is just the very simple, a weak AI as we use it. It can add so much the society if it's used on the right way. But you can also twist the way we deal with society, our democracy and so on. If it's not used the right way and we see that currently in the newspapers. And there are many ways to use it, for example the use of artificial intelligence in justice, in criminal justice, it can be used in a way which will empower the judges and the lawyers and so on to ask the right questions to discover the truth on the most efficient way, to respect the people and to be sure that everybody will be managed on the right way, the perfect way. But it can also be used to replace judges in a way that will not be so respectful. That could include a lot of biases which could include discriminations and which could appear as a very efficient if you zoom in and if you just see say the way it is implemented, but when it perhaps it will not be so beneficial if you de-zoom and try to have the big picture and see what's happening in the society. So we need to think about that. So for example, just using AI to replace judges is not just changing the method and doing the same thing. It's doing something different. For example, we switched from a justice of consequences. If you do something bad, you're going to jail to a justice of correlation. You are the box in the group of people supposed to have these behavior because of your ethnical, religious and whatever background, but it doesn't mean that you are guilty or not. It just means that you could be guilty. There's a certain risk that you are guilty. That's not the same way. For example, I'm going to put someone in jail because there is a risk or to put someone in jail because this person is guilty in terms of responsibility. It's absolutely different. So it's just one example, but we see that the anthropological and philosophical impact of the use of AI, especially in all the surveillance activities in other states but also in economy can be so strong, so deep and most of the time un-thought. Those are definitely things that can be used for good and there's obviously some things that could be used for bad and one of the things you've said is technology is not neutral. There's a lot of people who will say that it's neutral and even on some of the panels that I saw you on, you say, well, there's a specific purpose is what you've said. You know about specific technologies, so if there is a purpose, if there's intentionality isn't an important who the people are that are programming the artificial intelligence and what they're programming it to do? Yeah, the neutrality of technology is a dream, but now everybody is awake from this dream. Now. Nobody believes that anymore and we see that they're not even tools like a hammer, a hammer. The intentionality it behind the hammer is really poor because it's a very simple tool, but in AI or brain implant or any kind of devices or technologies of that kind, are so complex, so rich that the purpose is as rich as the technologies are complex and increases with the complexity of the technology and for sure we need to have a dialogue with the developers of those technologies because we cannot consider that doing something good is their responsibility. For sure it's partly the responsibilities of the companies, but it's also partly the responsibilities of the society and of all the institutions like the Catholic Church, to accompany the movement. We cannot keep silent and if they do something bad, say "Boo, that's bad. " No, that's not the way to be really responsible. The only way to behave for ourselves, the only way to act is to be part of the conversation and to raise the voice each time we see that a solution, technical solution will not respect human dignity for example, or the human nature or each time we see that something is going wrong and that's what we try to do at OPTIC. So having a fruitful dialogue based on a lot of, we are really optimistic, so we have a lot of good connections with those people and just trying to go ahead together and see what can be a pitfall or what can be an opportunity. That's great and I, like I said earlier, I'm glad that you're a part of a lot of these conversations now and there's not a lot of sort of leaders or people in who are Christians are in the religious work or who were a part of these conversations and I'm glad you are and I know there's a few others, but it's good to see. It's definitely needed. At the same time, there are some of these people, and so I mentioned Max Tegmark, and I'm actually a fan of his in terms of his work and he's a physicist and now kind of more on the AI side of things from MIT I believe, but very smart guy, but he's also one of those guys out there saying, "Well, we shouldn't have this carbon based chauvinism. AI could be a life form. You know, animals are a life form, you know, humans are just another life form." Which is sort of true, but you know, we as Christians or Catholic Christians believe that it's, we're a little bit special. God created us for a reason and we're special and so it is a little bit different. Also, you know, can machines have consciousness? Can they, you know, do they have a soul? So these are kind of very deeply rooted kind of questions that I think we're coming at somewhat opposite ends of the spectrum on a couple of these issues. I mean, what do you think about that in terms of people saying, well, we're carbon chauvinists? No. Uh, we had this conversation on stage at MIT. And actually, for me, even the way he phrased that was pretty funny. I mean he's a very smart guy. And I was happy with the meeting I had with him, but I think that's interesting at MIT on the other side, there are folks like Joi Ito, the MIT Media Lab, trying to fight against reductionism. You can say, okay, you can say that we're just a life form. We can copy and paste life. You can of create or elaborate new forms of life... On the paper, why not? I mean, as a believer you consider that it's not possible, but as a scientist you could consider as possible. But when you try to do it, you see that this reductionism consisting in considering that everything, including consciousness, everything including moral ... or ethic... can be put in zero and one, it just doesn't work and actually we cannot reduce everything in quantities, everything in numbers, in figures, that's not possible. There's a part which is part of the quality. There's a little something always reminding and you don't know what it is, which makes the difference between the human being and the animal or the human being and the machine and for sure you can move the lines considering that some animals are intelligent at some point, but that's really different from the human intelligence and the same for the machine. So that's interesting to see that even among scientists and especially technologists, there's a very strong debate on those questions and we don't have on one side believers saying human is specific for religious reasons or because of our faith. Also nonbelievers, will consider the human being as specific for other reasons, but more or less those reasons match with our ones are perhaps different ways to see a same question, but several of us say that there's a difference between the human being and it's not only chauvinism is just like open your eyes and see that there's a difference. Right. Well, and the other thing that came out from that panel that you're speaking about to me was there was very, it was supposed to be a a conversation about trans-humanism and bringing in various faith leaders and faith discussions and but very little discussion of God from that panel. So my question is can we have, for AI or any other types of issues that we're looking at, whether it's bioethics or other things, can we really have shared objective moral values without God? That's the tricky questions because putting values in the machine everybody agrees with that but which values? That's when the fun begins because actually there's no consensus in our societies currently. There's no moral consensus on the kind of values that we need to put in the machine even if we say respect a fly, respect of human dignity, what does it mean? It doesn't mean the same thing for different kinds of people and that will be our difficulties. We see that each time you use IT, not even AI, IT rushes you, teases you to be objective, to be very positive. For example, if you want to put a process online, you need to be very clear on the process. It cannot be all, "We'll see all. It's different each time." No, you need to have a very clear typology. It's yes, it's no, it's this way or it's that way. And so the same for the use of AI and the moral impact. It shows us our dissension. It shows the tensions in the society and for sure for me as a Catholic, I have a set of values I have in mindset which is let's say deeply rooted in the scriptures and for these reasons there's a kind of coherence in what I think and what I would like to implement as a set of values in the machine, but I understand that someone coming from a very different background. We'll have another set of values and the big question will be how to find something common and nothing that the only way actually it's not so far from encourages dialogue. It will be having a conversation and trying to see what's possible to do and we have to bring all the treasure of our tradition with without trying to impose it, but trying to propose it as clearly as possible to help, just to help people to see what's the point, how interesting it is, but we also have to be ready to be in a conversation. I cannot say, "It has to be done like that because God says... Blah Blah." Because all the other ones will say, "Ah yeah, and so what? So?" And that's the big issue currently in the conversation. We have to try to interact with the people, even time to time without putting God in the conversation. But actually, each time the human being is building something new and disruptive, my feeling is that God is never so far. Yeah. It's a difficult area and a difficult problem to solve and I'm glad you're thinking about it and part of these discussions I certainly don't have the answer and I don't think anybody does, but it's at least we're trying to come to some kind of an answer to it. But yeah, it's a tough one. Great. So you traveled the world and you speak to different audiences and I imagine you speak to laypeople as well and maybe you know, kind of other religious around the world as well. Do you think that people really are grasping some of these changes and or even thinking about some of these issues are mostly, or do you think mostly people just really aren't aware of might be coming in terms of some of these really disruptive technologies? I think we're in a time when people start to open their eyes and see that those technologies have a strong impact. They shape our society so they have a strong impact on our lives. Not only let's say on a daily life because using an AI as an assistant or this kind of device or smartphone or whatever is convenient, but also it changes the way we get information. It changes the way our, even now, the way our democracy is working... working or not working and we see that it has an impact and more and more people see that. And even among the developers of those technologies. I must say that I'm pretty happy to see that some people are very, very senior people in very big companies involved in development of AI or other disruptive technologies are out of concern in the possible misuse of their technology, but also in the possible pitfalls or side effects of the implementation of the technology, but also also why they come. They want to come and have a conversation with us and I cannot tell too much about that because this part of activities pretty confidential. Yeah. It's clearly behind closed doors so we can. We can deal with any kind of questions including the tricky ones, but for some of them, for example, I introduced some of them do the Holy Father and uh, last September we had a conversation with him about AI and yeah, it was interesting to see what's possible to do to make the use of AI more in positively impactful for the society. And what do we do or what can we do, I guess to help encourage more Catholics and other Christians and believers to become more aware and more interested in these technologies? I mean, are there things that you're seeing that resonate with people in the church and especially young people, are you seeing them getting excited about getting involved with these technologies? Oh, for sure. There's a big gap between generations and it seems that for the millennials or even the younger people, those technologies are so common, so it's so trivial that they will use that including for religious purpose and they will have no fear with that, but for the elder generation for sure there's a risk of fear or anxiety and I think that fear is not a good advisor and we need to keep that in mind that we need to help people to discover that in the beginning, let's say basically there's no fear to have. For example, even this morning I just received a message on a on a social network from someone sending me a video and he said how scary it is, and I said, no, not how scary it is first how full of hope it is, but actually because the link was a link to a video and the guy was explaining what's possible to do with AI and I would say that 90% of what he was saying was very positive and perhaps 10% were about the dangers, but the guy was so focused on the dangers that is send me the link saying, "Oh do you, see the problem?" No, I say, "I see part of the solution." and that's what we need to do. We need try to help people, especially in the church, to discover that technology is more part of the solution than part of the problem. That's great. Yeah, and that's definitely what we believe in here at Purpose Nation and just God has given us gifts of intelligence and to come up with these things and come up with technologies and you know, the gifts of science and the nature and a kind of utilizing those things and so we should be using them for our benefit in what God has called us to do, so to love him and serve him and to love each other and serve each other and what better way to do that through using some of these technologies rather than fearing them and yeah, as you said to me, there's definitely some dangers and I'm glad that you are keeping up with some of them and keeping some of these tech leaders honest as they approach it. And then I'm also glad encouraging to hear that they are also sort of having a second guessing I guess, or just being cautious, seeing potential dangers themselves. At least they're not rushing into it. It's good to hear that they're sort of seeking wisdom from people like Pope Francis and yourself and others. So what is coming up for you, Father, either over the next year with OPTIC and what kind of big things you have coming up over the next year? They say keep some surprises for the next month, so I cannot say so much about the current projects we have, but you will discover them pretty soon, but for sure we're expanding the network in a way which will allow us to expand the conversation, especially in Asia because they have so much to do in their interaction with countries developing another kind of AI based on another set of values and so on and we need to understand them to be able also to deal with them and so we're expanding that and we're welcoming more and more and more people in the conversation and we will present a very soon new projects helping people to bring this conversation at the very high level globally speaking. That's what I can say. Okay, great. That sounds great. It's exciting! I can't wait to hear. I'm going to keep, we'll keep in touch and when we hear the news we'll maybe get you back on the podcast. We're waiting for it. Well, Father Eric Salobir, thank you so much for calling in from Southern France to speak with us today. Continue to keep up the good work and may God bless you in all the work that you're doing. God bless you, too. Thank you very much. Brad. See you soon. Bye Bye.